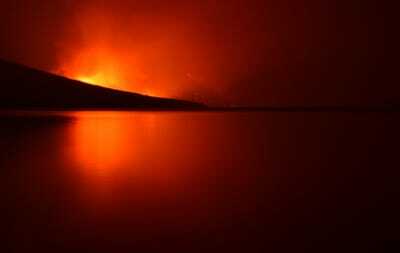 A wildfire broke out in Glacier National Park in the US on Saturday, forcing evacuations from the park. The park also saw record high temperatures on Saturday. Firefighters have had difficulty containing the blaze due to dry winds and a lack of precipitation. A fire in Glacier National Park, in Montana’s Rocky Mountains, has sparked evacuations over the weekend as record heat and high winds cause the fire to spread. The Howe Ridge Fire first ignited over the weekend after lightning struck on Saturday. The wildfire spread rapidly as triple-digit temperatures and high winds fed the flames. Over 150 people were evacuated from campsites near the blaze on Sunday evening, and many roads in the park remained closed to visitors as of Monday, per the National Park Service. The fire has expanded to encompass over 20 acres of forest as dry winds continue to whip the flames. A number of structures, including a historic lodge, have been evacuated. Local firefighters have been using planes to dump water over the blaze, but their efforts have been thwarted by high winds. The park, located in northwest Montana and named for the plethora of glaciers that carve through its valleys, also saw record-high temperatures on Saturday. The thermometer hit 100 degrees Fahrenheit in the park for the first time, according to the National Weather Service. Rising temperatures and changing precipitation patterns associated with human-caused climate change have also caused the park’s eponymous glaciers to contract, and for some to disappear altogether. In the mid-19th century, there were over 150 glaciers in the park. That number has since fallen to 26, according to a recent study from the United States Geological Survey, and the park’s glaciers are predicted to disappear altogether by 2030 if these trends continue. It’s not clear whether wildfires are contributed to glacial retreat. While triple-digit temperatures are unprecedented in Glacier, wildfires are a common occurrence. According to the National Park Service, fires occur naturally in the park’s forests. In 2003, over 136,000 acres of forest burned within the park’s property, and in 1936, 64 individual fires burned within the park. Glacier also isn’t the first national park to be threatened by wildfires this year. In July, the Ferguson Fire forced the closure of Yosemite National Park in California.